Sonic the Hedgehog: Triple Trouble[a] is a platform game developed by Aspect and published by Sega for the Game Gear in 1994. It is the sequel to Sonic Chaos and features classic Sonic series gameplay. The player can choose to control either Sonic the Hedgehog or Tails as they venture to protect the powerful Chaos Emeralds from others. Sonic and Tails can use items strewn across the stages, and differences in their abilities make for different gameplay experiences when playing as each character. Critics commented that the game was enjoyable and had excellent graphics, but lacked in challenge and had little originality to help it stand out from previous Sonic games. In retrospect, critics consider it one of the best Sonic games on the 8-bit Game Gear, coming closer than the others to matching the quality of its 16-bit counterparts. Triple Trouble was rereleased on various Sonic game compilations, the Coleco Sonic handheld system, and the Nintendo 3DS. The game features the debut appearance of Nack the Weasel, who would reappear in later Sonic media. Triple Trouble features classic Sonic series platforming gameplay. The story follows Sonic the Hedgehog and Tails in their efforts to stop others from obtaining the powerful Chaos Emeralds. Dr. Robotnik has tricked Knuckles the Echidna into helping his search; meanwhile, treasure hunter Nack the Weasel[b] is also searching for the emeralds. Players can control either Sonic or Tails through six different themed areas. Both characters play similarly, including the use of a spin dash move, but Sonic can perform a peel out while Tails can fly briefly. The player can use various items placed in the stages, such as spring shoes, underwater fins, and rocket shoes. Some can only be used by one character. The differences between Sonic and Tails results in their paths for traversing stages differing between one another. The player collects rings as they explore the stages. When hit by an enemy, the player will lose 30 rings, or 50 if they touch a spike obstacle. In other Sonic games, the player would normally lose all their rings for any damage. If the player has 50 or more rings and destroys a box with a Chaos Emerald icon, they will be transported to a special bonus stage for an opportunity to obtain the gem. Some of these stages are labyrinth-like platforming stages while others have the player piloting a plane, collecting rings. 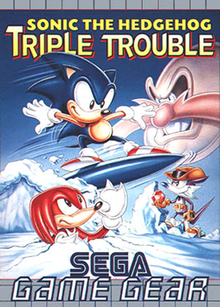 Triple Trouble was developed by Aspect, and is the sequel to Sonic Chaos (1993). The game introduced a new character in the Sonic series, Nack the Weasel, who was originally called Jet during development. Nack was shown with a gun in early promotional screenshots, but this was removed in the final game. The game was originally titled Sonic Chaos 2 in Western territories, with releases planned on both of Sega's 8-bit systems, the Game Gear handheld console and Master System home console. The game was ultimately only released for the Game Gear, making it the first Sonic platformer released exclusively for the system. It was released in the West around October and November 1994, and in Japan on November 11, where it was titled Sonic & Tails 2. The game was rereleased multiple times. It was included with other Sonic Game Gear games in Sonic Adventure DX (2003) and Sonic Gems Collection (2005). It was later released on the Nintendo 3DS via the eShop in March 2012 alongside other Game Gear titles. This release was developed by M2. The game was also included on the Coleco Sonic dedicated handheld console in 2006. Critics felt Triple Trouble was fun but too similar to previous Sonic games, and felt the series was beginning to be strained. Other than the addition of vehicles, many felt the game lacked originality. Mean Machines Sega wrote that it lacked "surprises and gameplay innovation" and that it was "going through the same mid-life crisis here that Sonic and Knuckles represents on the Mega Drive." They felt the game was a good 8-bit counterpart to Sonic 3, as did Sega Magazine, which noted similar level themes shared between the games. Some critics enjoyed how the levels were large and inviting for exploration. The graphics received universal praise. Mean Machines Sega wrote that the backgrounds and character sprites were "the best to grace the Game Gear," and superior to previous Game Gear Sonic games. Sega Magazine and Sega Pro felt the visuals approached the 16-bit quality seen on the Mega Drive Sonic games. A couple critics noticed frame rate dips when the screen was busy. Sega Magazine believed that other Game Gear Sonic games were just cropped versions of the Master System versions and thus suffered gameplay wise, and felt this was not a problem with Triple Trouble. One of the most common complaints was a lack of challenge. Several critics felt the game's stages were too sparsely populated with enemies, making the game too short and easy to complete. Computer and Video Games and Mean Machines Sega believed this lack of challenge harmed the game's long term value to players. Sega Magazine wrote that the lack of enemies was probably to keep the game's frame rate from dipping excessively. In retrospective reviews, Triple Trouble is considered one of the better Sonic games on the Game Gear. GamesRadar+ felt the game was "reasonably competent" but no less tedious than other Sonic Game Gear games. GameSpot believed it did a better job capturing classic Sonic gameplay than other games on the system, due to it being a later release and thus more technically competent. Nintendo Life agreed, writing that Sega had made a strong attempt to capture classic Mega Drive Sonic gameplay on the Game Gear, and believed Triple Trouble was "probably the closest thing gamers could get to the overall style of play of the 16-bit titles on a handheld." Diehard GameFan appreciated the 3DS release for adding different resolutions, button configurations, and save state support. Nack the Weasel would later be known by his Japanese name, Fang the Sniper, in Western regions. The character was included in some Sonic comics series, and in the games Sonic Drift 2 (1995), Sonic the Fighters (1996), and Sonic Mania (2017). An unofficial fan remake is in development, being built on the GameMaker Studio engine with a 16-bit style. The developer was inspired to remake Triple Trouble after playing it and thinking it was a "good classic Sonic game buried under 8-bit limitations." He is planning on upgrading the graphics, music, and adding the option to switch between Sonic and Tails at any moment in gameplay. ^ Nack was originally known in Japan as Fang the Sniper, and would later be known as Fang worldwide. ^ a b c d e f g "ProReview | Sonic the Hedgehog: Triple Trouble". GamePro. November 1994. p. 206. ^ a b c d e f g h Madson, Sean (March 22, 2012). "Review: Sonic the Hedgehog: Triple Trouble (Nintendo 3DS/Sega Game Gear)". Diehard GameFan. Archived from the original on August 6, 2016. Retrieved December 8, 2018. ^ a b Dillard, Corbie (March 20, 2012). "Review: Sonic the Hedgehog: Triple Trouble (3DS eShop / GG)". Nintendo Life. Archived from the original on September 27, 2017. Retrieved December 8, 2018. ^ a b c "Strangely Sonic". Mean Machines Sega. No. 20. June 1994. p. 14. ^ "Sega Gamer's Day". VideoGames. No. 67. August 1994. p. 46. ^ a b Pétronille, Marc; Audureau, William (2014). The History of Sonic the Hedgehog. Pix'n Love. p. 167. ISBN 1926778960. ^ a b "Newsbox: Sonic Kehrt Zurück!". Sega Magazin (in German). No. 10. September 1994. p. 6. ^ a b c d e f g h i "Game Gear Review | Sonic the Hedgehog: Triple Trouble". Mean Machines Sega. No. 26. December 1994. pp. 108–109. ^ "ソニック＆テイルス２のご紹介". Sega Virtual Console (in Japanese). Archived from the original on June 9, 2017. Retrieved December 9, 2018. ^ "Sonic the Hedgehog: Triple Trouble". Nintendo Life. Archived from the original on September 2, 2018. Retrieved December 9, 2018. ^ Drake, Audrey (March 29, 2012). "Nintendo eShop: March Round-Up". IGN. Archived from the original on November 2, 2018. Retrieved December 9, 2018. ^ "Sonic the Hedgehog: Triple Trouble". Nintendo. Archived from the original on October 2, 2017. Retrieved December 8, 2018. ^ Farivar, Cyrus (October 27, 2006). "Coleco Sonic Handheld debuts: take home 20 Sega 8-bit games for $50". Engadget. Archived from the original on December 10, 2013. Retrieved December 9, 2018. ^ "ソニック＆テイルス2 [ゲームギア]". Famitsu (in Japanese). Archived from the original on June 15, 2015. Retrieved December 9, 2018. ^ a b c d "Supershorts...". Computer and Video Games. No. 157. December 1994. p. 143. ^ a b c d e f g h i j k "Game Gear Review | Sonic the Hedgehog: Triple Trouble". Sega Magazine. No. 11. November 1994. pp. 82–83. ^ a b c d e "Sonic the Hedgehog: Triple Trouble". Sega Pro. December 1994. p. 73. ^ a b c d "Review Crew: Sonic Triple Trouble". Electronic Gaming Monthly. Vol. 7 no. 11. November 1994. p. 46. ^ "Sonic Gems Collection review". GamesRadar+. February 25, 2006. Archived from the original on June 22, 2018. Retrieved December 9, 2018. ^ Davis, Ryan (May 17, 2006). "Sonic Gems Collection Review". GameSpot. Archived from the original on August 17, 2017. Retrieved December 9, 2018. ^ a b c "Gems Collection: The Fighters". IGN. August 5, 2005. Archived from the original on September 5, 2018. Retrieved December 9, 2018. ^ "Court-Martial". Sonic the Hedgehog. Archie (40). November 1996. ^ "Treasure Team Tango, Part Two: The Cruzada". Sonic Universe (22). November 2010. ^ "It's a Small World". Sonic the Comic (148). February 1999. ^ "Sonic Mania's Rampant Easter Eggs Enhance The Experience". Siliconera. August 18, 2017. Archived from the original on December 9, 2018. Retrieved December 9, 2018. ^ Horowitz, Ken (March 23, 2018). "Interview: Noah Copeland (Sonic Triple Trouble Remake)". Sega-16. Archived from the original on April 5, 2018. Retrieved December 9, 2018. This page was last edited on 21 February 2019, at 17:44 (UTC).